Or if you're short on time, you can just email your ad to info@ethicaljobs.com.au. We’ll post it for you right away for just an extra $25+GST per ad. Why advertise your job on EthicalJobs.com.au? Why pay up to $695 for a job ad on a big, generic job website, and then spend days trawling through irrelevant applications? Job ads on EthicalJobs.com.au are just $120+gst per job, with discounts when you buy multiple job ad credits. Better applications, less junk, and all at about a third of the cost of advertising with a big jobs board … what more could we ask for? 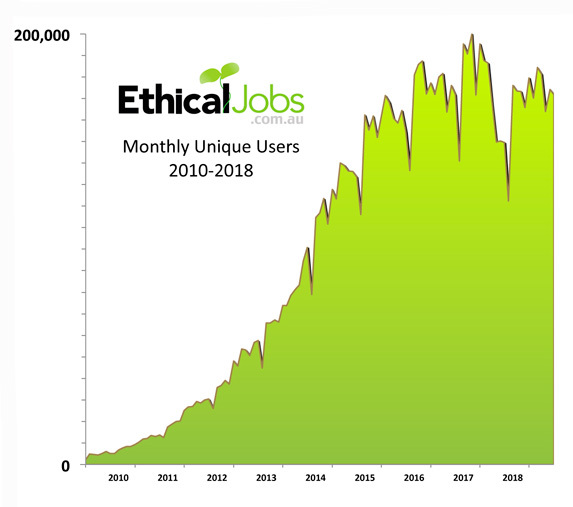 EthicalJobs.com.au attracts over 200,000 unique visitors per month* and new jobs are emailed to 135,000+ subscribers around Australia via our weekly update. Full page advertisement with logo, unlimited text and a short summary listed in search results. Live online listing for up to 45 days. Any ad can also be "featured" on the EthicalJobs.com.au homepage (in rotation with other ads) for the cost of one extra advertising credit. Just purchase 2 or more credits and select this feature when posting your job ad. Click here to download full details of our rates. On this site "Ethical Jobs" are defined as jobs that contribute to a more equitable, more just or more sustainable world. a) Any job in an organisation or company where the organisation's primary focus is contributing to a more equitable, more just or more environmentally sustainable world. b) A job within any organisation or company where the job itself is primarily focused on creating a more equitable, more just or more environmentally sustainable world. The only organisations completely excluded from advertising jobs on this site are those which either derive income from, receive significant funding from, or have significant ties to the tobacco, military, gambling, uranium or fossil fuel industries. If you're unsure if your job ad belongs on EthicalJobs.com.au, please contact us for a prompt reply, or just post your ad, and we'll contact you if we have any concerns. Give us a call on (03) 9419 5979 during business hours, and have a chat with us. Or email us any time at info@ethicaljobs.com.au.